The new Google browser Chrome is available since today. 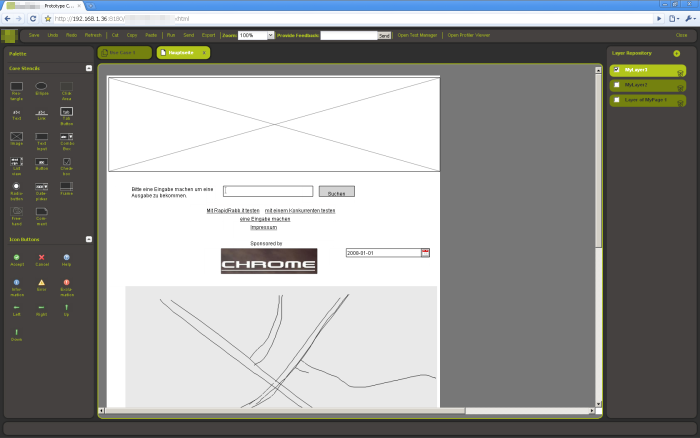 As it is based on Webkit we immediately tried to run our Prototype Creator in Chrome. We’re happy to see just another browser supporting SVG and therefore being a candidate for our Prototype Creator. Just Microsoft is still missing…. The screenshot shows our development version, with the improved design, running in Chrome. You will be able to see the new design together with new features at the “Mensch und Computer” next week. During the next days we will introduce some of the new features in here. So stay tuned!